Eight of us showed up for the workshop, graciously hosted by Jane. We all learned a lot, Collen is such a great instructor. I'm hoping she'll post a tutorial on her blog. We all had a good time, learned a lot, and Jane had a Baked Potato Bar set up for lunch! We all contributed to the ingredients and desserts. People left and different times, and I failed to get a group photo with everyone's EPP work. This is mine. We had a wonderful November meeting. Here're some highlights from the Show and Tell. We love seeing what everyone has been doing. First up, Jane asked for advice on how to clean sticky residue from her irons' soleplate. Collen knew the answer, Lemon Essential Oil. She said, just the cheap stuff works great! 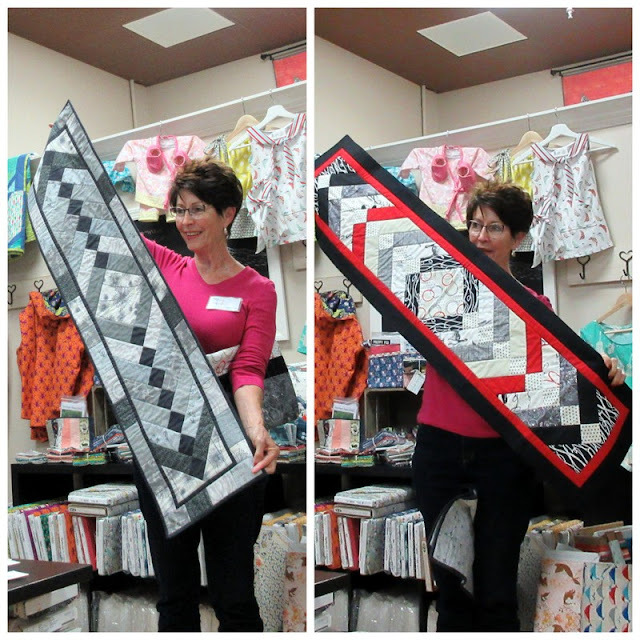 Linda shared the two table runners she made, same pattern, what a difference! 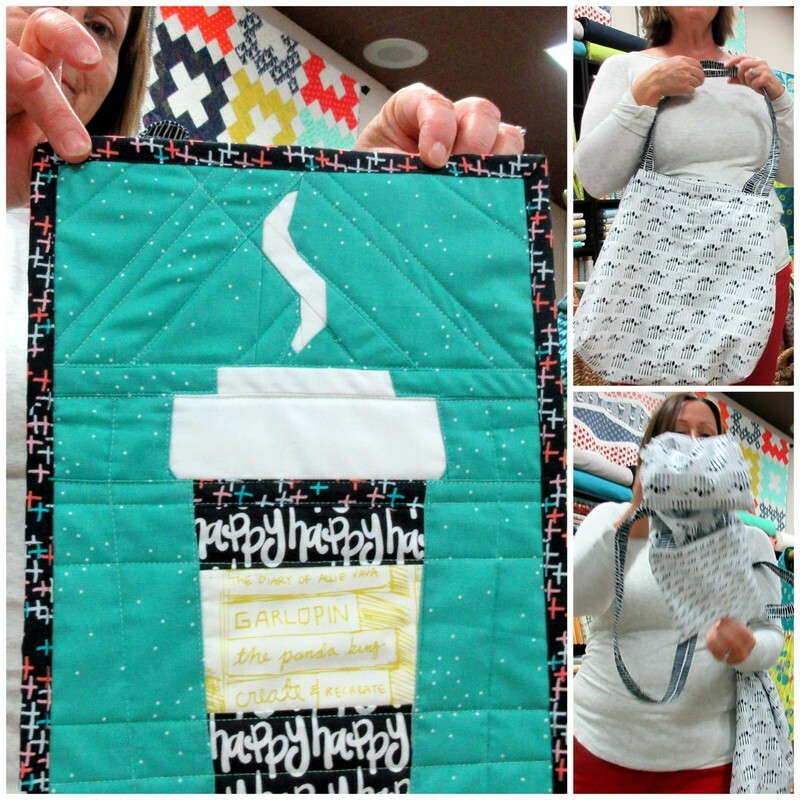 Sue created a Happy, and very large mug rug for her son and she showed off the new shopping bags that she's writing a pattern for. Next, we had a guest. Cammie is Madeline's' daughter. 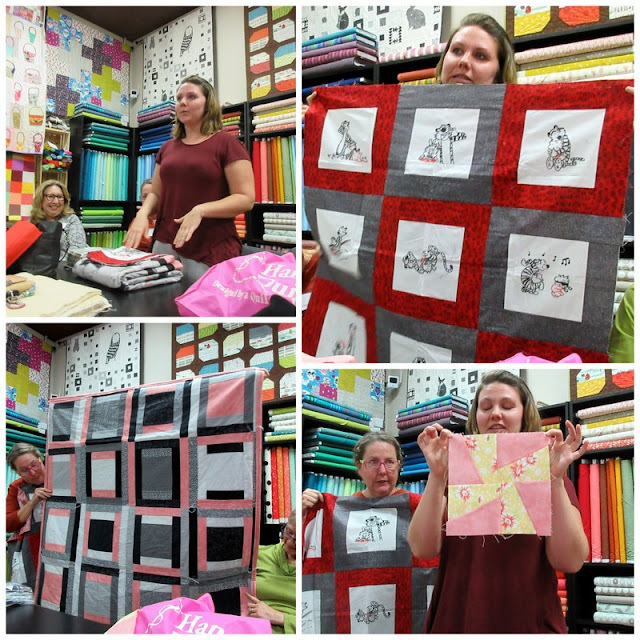 She shared an embroidered quilt top featuring Tigger, then her first quilt block, and last but not least, her first finished quilt. Great job, Cammie. Nancy had two great quilt tops to show off, and the purse she created from her "practice" FMQ samples. 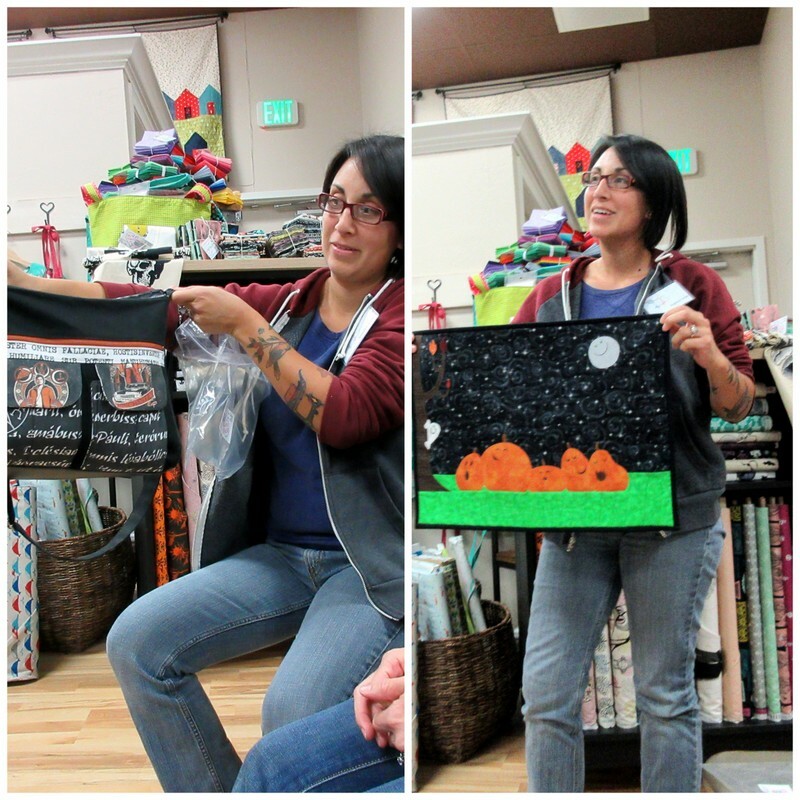 Maritza is taking classes in Heirloom Sewing. She showed one of the examples she's created. 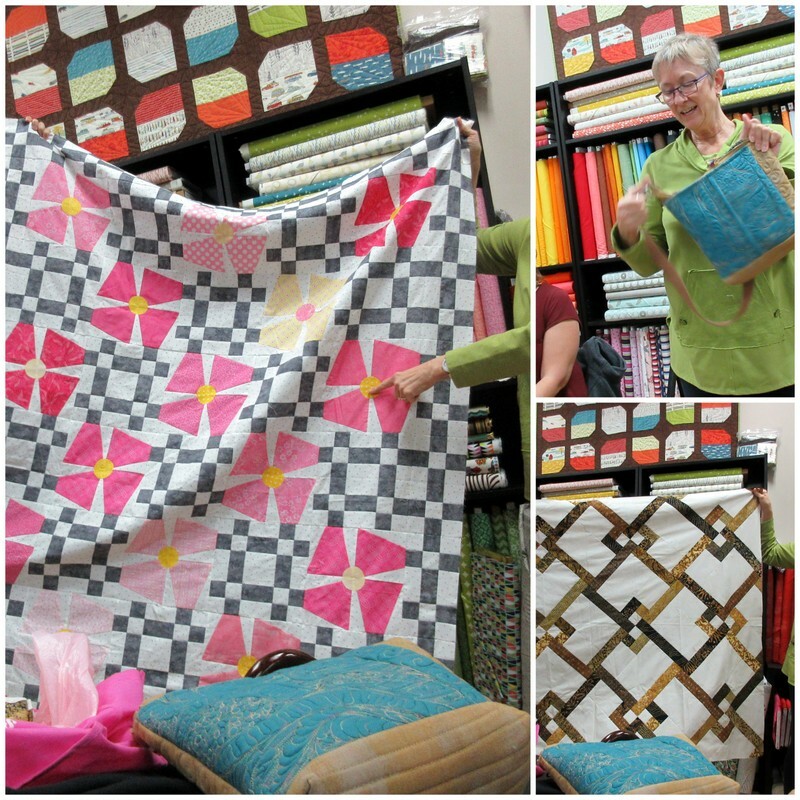 Jan showed the two Queen-size pillow shams she made for a customer. Angelica showed the handmade bag she was gifted and the adorable Halloween wall hanging she made. Collen showed us the English Paper-Piecing project she's working on and a mug rug made from 1" squares! The tiny pompoms look a lot like a zipper! Our December meeting will be a Christmas party at Maritza's home. Please bring finger foods, appetizers and desserts. We will also be exchanging zipper pouches. Please put the zipper pouch you bring to exchange in a brown paper lunch bag. The December meeting will mark the end of our first year as a MGQ! In January we will change meeting locations. The new venue is Primitive Gatherings in Murrieta. The address is 26855 Jefferson Ave D, and the cross street is Date Street. The meeting time will remain the 3rd Thursday at 6:30pm. The Nomination Committee presented the nominations for next year. And Angelica volunteered to help anyway she can. Jan's presentation was about how to start a blog. 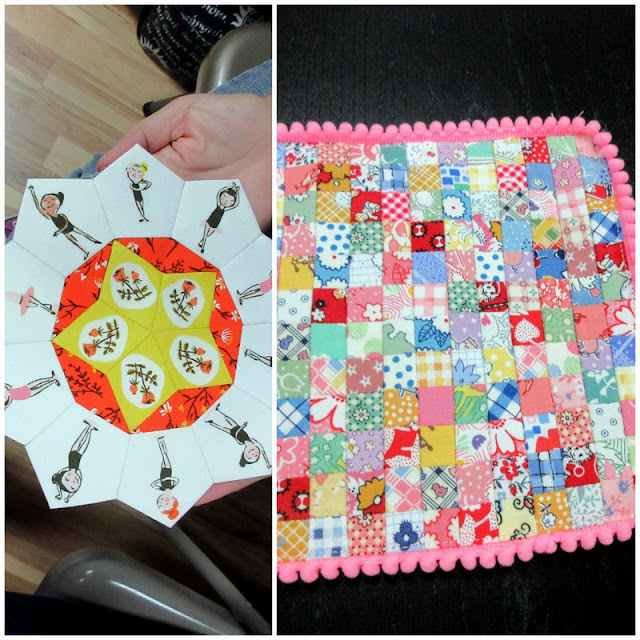 Blogging and quilting really do go together. Hope to see everyone at our December meeting. Maritza's address will be in the newsletter email. Blogging and Modern Quilting really do go together. The founders of our Modern Quilt Guild met online, thru their blogs before they met in real life. Sign into Blogger at blogger.com, if you have a Google account, use that information. If you’re new to Google, create an account. In the top left, click “New Blog”. 1. Enter a name for your blog. The name of your blog does not need to match your blog address. The name of our guild blog is Temecula Valley Modern Quilt Guild and the blog address is tvmqg.blogspot.com; by using blogspot.com, it’s free. One of my blogs is Janice Elaine Sews, but the blog address is jansquilts.com, by using .com, I pay for a domain name, $10.00 a year. 2. Choose a blog address, or URL. This will be used by readers to view your blog. The best blog addresses are easy to remember. Blogger will check during this step to make sure no one else is using that address. If it’s not available, go to Plan B! 3. Choose a template. Don’t over think this step. You can change the template as many times as you want, whenever you want. 4. Click Create blog. Now, you’re ready to Rock and Roll. My best advice is to post on you blog often. If this is going to be a quilting blog, don’t just post finished quilts. Post your fabric pull and what you’re planning, post your progress/process, post when the quilt top is finished, post about making the quilt back. Post when the whole thing is a done deal. Include photos in each post, too. Readers like photos. If you post readers will come. I’ve met many great people via my blogs. Some have become real friends who I’ve gotten to know IRL (in real life). I don’t monetize my blogs, not because I don’t like money but because it’s a hassle that I don’t want. Many people do, and some make a living at it, like The Pioneer Woman. Another popular platform is typepad.com. All the platforms are easy to use.